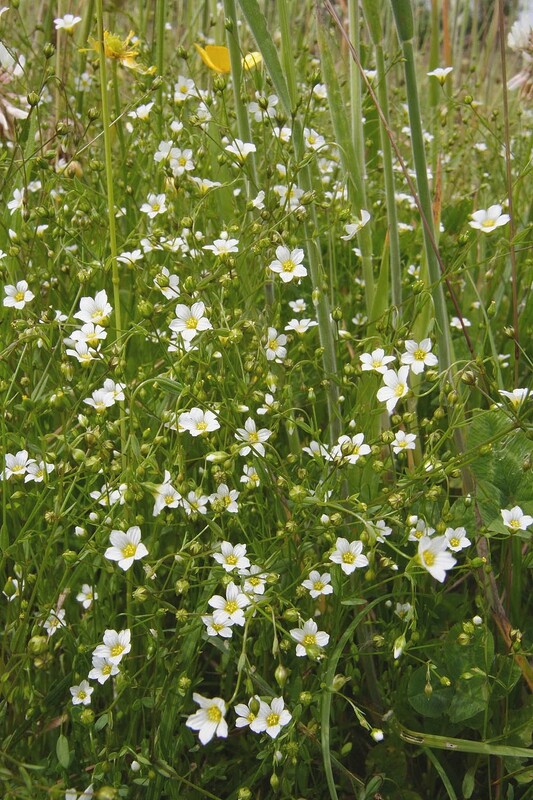 Fairy flax is a delicate and attractive little biennial (or occasionally annual) with bright white, yellow centred, flowers consisting of five petals. As with other flaxes the undivided leaves are arranged in opposite pairs and the fruit capsule has a distinctive rounded shape. Its specific name and its other common name of Purring Flax refer to its somewhat startling laxative effects (not recommended). Flowering occurs from June to late September. 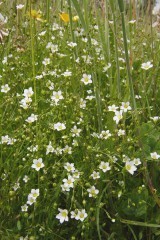 Fairy flax is a native, winter green biennial found in open, infertile, calcareous grassland and in base rich flushes in neutral or mildly acidic soils. Although most often thought of as a downland plant it can also be found in short sedge fen, mires, rocky outcrops, quarries and road cuttings. Because of its diminutive stature fairy flax can be lost from sites where more robust vegetation can get a hold so it is usually found where environmental factors limit growth or where new open areas are created through disturbance. Best sown in the autumn as seed requires a period of chilling to break dormancy. Should sowing have to be carried out at other times the seed can remain viable in the soil until the following spring.